Most theatre school students do not graduate to a career in the theatre. While theatre may be an important part of their experience, it simply does not have enough employment opportunities for all theatre school graduates. It has, in fact, very few. If we can accept that premise moving forward, obvious questions spring to mind. What is theatre school for? What is its value to the great masses of us that it has produced who, for many different reasons, are not in the theatre’s employ? 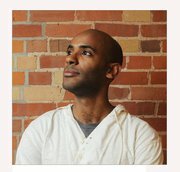 Lwam Ghebretariat is a graduate of Canada’s most reputable theatre school, and yet he has never pursued a career in acting. He has persued a very different career, which he says has a unique connection to theatre. After graduating from the National Theatre School of Canada in 2003, Lwam stayed in school, completing a BA (Honours) in philosophy and French at the University of Alberta. He is currently in his final semester of law school at the University of Toronto. As an undergraduate student he spent his summers researching Eritrean/Ethiopian literature and culture (some of that work can be seen here). As a law student he has worked and volunteered at Downtown Legal Services, representing low income clients in criminal court and disciplinary hearings, and at the African Canadian Legal Clinic, in the area of human rights litigation. As an actor he most recently appeared in Homegrown (by Catherine Frid, directed by Beatriz Pizano/Aluna Theatre, Summerworks 2010), a play which received national media attention. Other credits include Twelfth Night (Canadian Stage) and Ministry of Love (Theatre Rien Pantoute). Since this interview, Praxis has learned that Lwam was recently voted Valedictorian for his graduating class. So congratulations Lwam! We’re pretty sure your theatre training will come in handy. Filed under Exit Interviews, Lwam Ghebrehariat. Interesting. Had the opposite experience when I went to McGill University for my undergrad – pretty sure I was gonna be a lawyer. Then I ran into Director Alexander Marine who was directing Mainstage shows there – did three with him (Arcadia, Life of Galileo, The Nose) and opted for a life of poverty (theatre). I said elsewhere that telling a better story is different from telling a story better and it is the first that should be the focus in a court of law. This is perhaps a statement in need of defence and explanation. In common law, each side comes to court with a ‘story’: this story tells the court what the facts of the case are, what are the applicable laws to these facts, and what is the proper way of applying these laws to these particular facts. Now these stories may be better or worse in the sense that they may be more or less accurate renditions of the facts, more or less accurate presentation of the applicable laws, and better or worse argued application of the laws to the facts. Here the lawyer needs the argumentative skills of say a professional writer and the clarity of thought of say an analytic philosopher. These stories may also be told in a better or worse fashion in that they may be presented to the court in more or less sympathetic or persuasive language, or conveyed more or less powerfully through the in court performance of the lawyer, who will need the persuasive skills of an orator and the performance skills of an actor. I think the perfect lawyer would have both sets of skills, but it seems to me that the judgment of the court ‘must’ be constrained by the first and only perhaps augmented or inspired by the second.